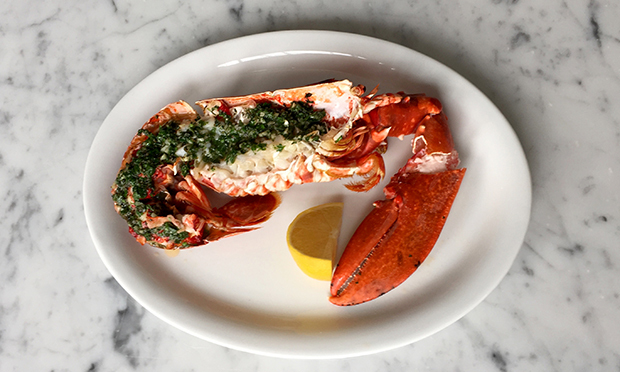 There is now a lobster bar in Hackney Central. While we were all processing the idea of ramen on Mare Street, Lobster Bar opened with little fanfare in early September, nestled between Raw Duck and Lardo, serving seafood, steaks and cocktails. Cristine Leone, its director, runs the popular Ivy’s Mess Hall and, until recently, the now shuttered Little Ivy’s on Lower Clapton Road. Of the latter, Cristine says its success was also its demise: “People who came for a meal would stay for hours,” she says, “which was great…” The small number of tables however, meant the venture wasn’t financially viable without cuts to quality. So the team decided that rather than compromise they would open Lobster Bar, where I can happily report that no such cuts are apparent. The seafood is excellent: we had Maldon oysters on the half shell, followed by a smoky, meaty, decadent chargrilled octopus leg (more on this below), as well as seared scallops on a bed of silky cauliflower purée. The lobster melted in the mouth (partially due to generous quantities of butter), without any of the dryness I often associate with lobster. We also had a steak that was tender enough that I suspect it could have been eaten blue, and wasn’t just a standalone for those who hate shellfish. The restaurant’s inventive cocktails featured a plethora of Italian liqueurs, and as I am wholly uneducated when it comes to wine that is not of the most basic French or Spanish variety, our friendly waiter gently guided us to a stunning Riesling, with sweet undertones but dry enough to partner up with seafood. We concluded the meal with a delicate poached peach, wexcellent food and servicehich brings me to my only qualm with LB, and extends to most new restaurants I’ve visited in the last year: a sense of reiteration. LB’s tasteful, gleaming “warehouse chic” interior is so similar to its neighbours that after being seated, I expressed consternation that Raw Duck had shut, believing to be in its former premises. Similarly, there’s food déjà vu: the grilled octopus leg, the single peach as pudding: both have appeared multiple times in places I’ve reviewed in the last 12 months, the peach being at the last three consecutive places I’ve visited. Rillettes and Burrata, while not on the menu here, have also popped so frequently that they seem on track to become the next truffle fry and brioche bun. I don’t, however, want to detract from the excellent food and service we received at LB, which, on the whole, seems to be what we’ve come to expect from new local ventures, along with charcuterie and pisco sours.